If you're not familiar with the music I went over in Part 1, you should probably go have a quick look and listen. The rest of this post is behind a cut for potential Mass Effect and Mass Effect 2 spoilers. Mass Effect 2: the opening titles begin, and we are staring, frightfully close-up, at a multicolored sun. A woman who we soon learn to be Miranda is discussing Shepard... with The Illusive Man. He is the beginning and the end of this game, the would-be puppet-master pulling all the strings. Of course, he doesn't have all the strings available to him, and that's where much of the drama comes from. But we get ahead of ourselves. The music, however, tells us this story in a hundred ways. The Illusive Man, it says, owns everything about ME2. He is always there behind the scenes. And nothing, in this game or in Shepard's mission, will be easy to define or to pin down. 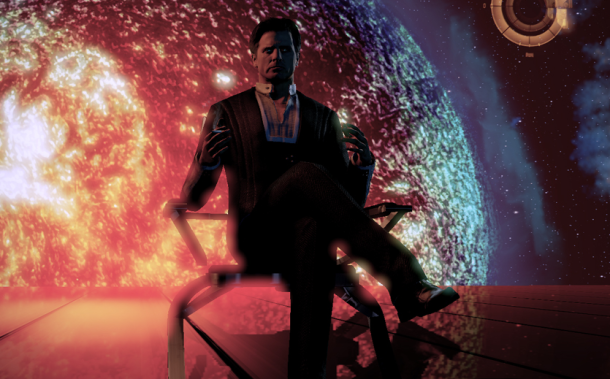 More important than any theme from Mass Effect, in Mass Effect 2 we begin straight off with The Illusive Man. Ideally the player finds these two minutes unsettling and mysterious. This track is quite literally designed to throw the player off-rhythm. Shepard the Alliance Marine had a way of behaving from the first game. She had a team, she had the Normandy, and she had a hero's theme. That's all gone now. The Normandy is most decidedly wrecked and Shepard literally went down with her ship. (Or worse, actually: outside of it, with a hole in her suit.) Two years and an unimaginable amount of cash have gone into rebuilding her and bringing her back to life through the Lazarus Project. And who is behind that decision? A man we can't pin down, not even musically. The theme from Mass Effect was a calm 3/4: three beats in a measure, easily counted and easily followed. Easily marched to, too, and that's actually important. It's literally straightforward, and you can take the Alliance into battle with it. The Illusive Man, however, is not so easy to pin down. The entire piece is rhythmically irregular. It's mostly written in 7/8, and the thing about odd prime numbers is that they don't subdivide neatly. When a piece is in seven, the individual beats themselves come out feeling uneven, because they're grouped in twos and threes, rather than in the twos or threes we are more accustomed to hearing in most music. Thus: off-kilter. I'm harping on this point for a couple of reasons. One, admittedly, is simply that it's unusual and I enjoy it. But the main reason is that it pulls against all the rules we have been taught to expect in our film and game music. It's ambiguous: the 7/8 and 9/8 have the same number of actual eighth note beats as a pair of 4/4 measures (like the Star Wars main theme) would. But the music doesn't flow that way and instead breaks up its rhythm in a more winding, hard to follow pattern. In a very broad and generalized sense, musical ambiguity in scoring conveys moral or character ambiguity. We like marching rhythms for our heroes and save irregular meters for our villains. The orcs and Uruk-Hai in Lord of the Rings march in 5 (1-2-3, 1-2): you can imagine them dragging misshapen legs behind them as they go. Meanwhile, heroes tend to have rhythmically straightforward themes. Yes, it's thematically very closely linked to the Mass Effect theme, though opening in a different key. But the ME theme was in 3/4, which breaks down into having 6 eighth notes per measure in three sets of two: (1-2) (1-2) (1-2). You can prominently hear this pattern in the original theme at the 00:59 mark. However, this Mass Effect 2 music is mainly in 7/8. It adds one extra beat, running (1-2) (1-2) (1-2-3) and throws us off our rhythm. He's illusive AND elusive, but don't mix the two at him. But even then, this piece does to us what his theme does, and changes the rhythm on us as soon as we get comfortable with it as it stands. From 01:26 to 02:40, it reverts to a regular 3/4, momentarily bringing us back to the relative peace of the first game and also calling up its elements: the Citadel, the Alliance, and so on. Shepard's not with the Alliance in this game and despite being on version 2 (bigger, badder) of her own Normandy, you're really not supposed to forget it. All of her ship-board outfits are Cerberus uniforms. Her crew is a Cerberus crew. Her faithful allies (Tali, Garrus, Wrex, Ashley / Kaidan) from the first game are all taken aback by this to varying degrees, and Shepard's reception in places she might formerly have been welcomed is... chilly. Everything has changed for Shepard, as she (involuntarily) left the Alliance behind and woke up as a Cerberus asset. Including her theme. It's now tinged with two overriding, inescapable elements: (1) the Illusive Man's influence in all things, and (2) the drama laid upon her by the game's structure (no-one's ever come back from the Omega 4 relay before, so we'll have to be pretty badass to manage it). In fact this theme music is mostly drawn from "The End Run" and "Suicide Mission," which are, as in-game events, exactly what they sound like. These themes play when all of the pieces are set and the final battle is in motion. Your crew are recruited and they are as loyal as they are ever going to get (damn Miranda). You are up against Collectors, the agents of the Reapers, and there are no more second chances. This is where everything's come together, and the music in a way reflects that. I love how many different tones are represented in this pair of tracks, and how they help summarize the feel of the plot by their point in the game: this is a battle, there's no doubt about that, and it's Shepard's battle. But the Illusive Man is still there (in all of the 7/8 material) as are reminders about what she's really fighting ("The End Run," 01:26 - 01:42). Also for whom she's fighting: versions of the plinky descending notes from the first Mass Effect ("The End Run," 01:43 - 01:47; "Suicide Mission," 02:09 - 02:43) more-or-less represent the Citadel, the Council races, and the good guys in general. And then the track ends with that solo trumpet. Although everyone made it out of the Suicide Mission alive for me (I thought for sure I'd lose disloyal Zaeed and possibly reckless Jack), I like the mournful call there for those who don't come back. There is a lot more to write about the music in both Mass Effect and Mass Effect 2. There will be a part 3 to this discussion, in which we examine how the Normandy is given character, the influences and borrowed phrases we hear (particularly in ME2, because they keep leaping out at me), other uses of irregular or conflicting rhythms to create tension, and other cool bits and bobs in general. I wanted to keep part 1 and part 2 as two halves of a more straightforward comparison of how the main themes are manipulated to tell the story so everything else has gotten bumped. Look for part 3 to run in a week or so. I'm not much of a musician, I was always poor at reading music, and I don't have synesthsesia, but at least with instrumental music I've always seem to be shooting film in my head to go along with the music. This is one reason, totally without mind-altering chemical assistance, I listened to a hell of a lot of instrumental electronica and film soundtracks when I was a kid (and still do). There's an Orbital track that has always generated a video track of two planets at war, eventually shooting huge asteroids at each other, ala Babylon 5 or Starship Troopers for whatever reason, and I can't shake the video out of my head whenever I hear it. So how this matters here, is the Suicide Mission track, which part of it is the title theme and the title theme that plays at the beginning always puts a picture of someone jumping off a ledge, and the rest of it is a kind of free fall. Someone in free fall, hanging on, for some reason, to a spear, that he's pretty well hoping is going to kill this damn thing once and for all, because he's got no other option at this point. Screaming defiance the whole way down, of course. As I was thinking of this, as I was listening here and working out these thoughts, I realized what I was transposing on this, at least partly: the "Long I fell..." scene at the beginning of the Two Towers movie with Gandalf vs. the Balrog, which happens to be one of my favorite scenes in all those movies. Then I realized that the arc of Mass Effect 2 is basically the same arc as the Lord of the Rings, complete with decision whether to claim the ring (ie, don't destroy the Collector base so Cerberus can use it for good). Then I started laughing, realizing that I now have to play the game through AGAIN, after just finishing a run through so I can tear this whole bit apart. There's a lot to be said there -- but I personally think it's more that both stories are, in different environments, drawing from the same well of our Heroic Archetypes. Gandalf was neither the first nor last hero in the Western tradition to pass through death and return. Actually, if you ask me (which no-one did, but it's my blog and I'll opine if I want to) the one thing that saves Shepard from being a cloying and troublesome Savior trope is that she does not choose to return. Cerberus chooses for her. When she threw her crew into escape pods and got punted into the vacuum, as far as she knew she really WAS going down with her ship, with the one and only life she had. Usually it's some quality specifically about the hero that brings them back, but with Shepard it was an intervening outside force and that's what makes it interesting. As for Temptations... I think the thing I love about gaming is that it lets both decisions be made and exist. You can choose the temptation and see the "what if," whereas in our other story forms, when the hero chooses to let the temptation lie, it's the "what if" that will claw at him. Well, firstly I'd like to make clear what I meant. I'm not saying that this is basically a rewrite (unlike, say, The Sword of Shannara which was too close for comfort). The writers of Mass Effect (and I do believe, after thinking a night on the subject that this works across the whole series, not the individual game) did not try to slot someone in every part. Multiple characters perform the roles given characters in LotR, and individual characters fill multiple shoes. I think there are some pretty stark parallels. Well beyond a Joseph Campbell style monomyth connection (which I did some more pointed reading on overnight, and find less insightful the more I think about it). Also, I think the similarities are less to the book, and more toward the film trilogy. Gandalf is a soldier as much as Shepard is. The wizards are in fact the special forces of the Valar, sent to fight the last battle against the forces of the Enemy. A link between the Istari and the Spectres isn't hard. Of course, Shepard doesn't only put on the Gandalf hat, but the Aragorn and Frodo hats as it warrants. I could go further down this rabbit hole, but it's probably better if I don't threadjack. I love the music of both Mass Effect games. I listen to it all the time. Legion is one of my favorite tracks. But they are all so great. What do you mean "almost"? Why haven't you played already? Love the post. It would be great to hear something about the Ilos music, which goes with the chase, and is interupted by the conversation with Vigil - which again has itss own music. That latter music is the title screen music, and really captures the atmosphere of ME1 for me - it captures the mornful triumph of the protheans at Ilos. I really appreciate these dissections. I can't believe I never noticed that Sovereign's theme was a messed up version of the main theme. I look forward to reading your forthcoming article. I hope you'll find time in your next post to talk about Vigil. It's permanently linked with the first game for me and I'd love to see it picked apart. Thanks for a fascinating series — this is wonderful.